SAL DeTRAGLIA'S VIRTUAL TAPAS BAR: READING IS FUN-DUH-MENTAL. 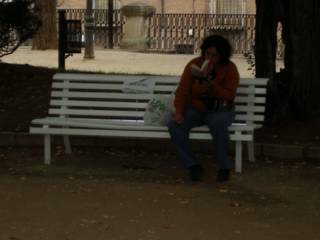 We were in a park in the city of Guadalajara (Spain) yesterday, when I noticed this woman reading on a bench. While I certainly applaud the intellectual way in which she spends her free time, it’s unfortunate that she didn’t read the sign taped to the park bench as intently as she read her book.